Stir together all the dry ingredients. Sift them and collect it in a large bowl. Add eggs, milk, oil and vanilla extract and beat on medium speed for 2 mins. Now stir in the boiling water. The batter will definitely be thin. Preheat the oven to 350°F or 180°C. Grease and flour two 9-inch baking pans or any desired pan. I used one flower shaped pan and one square pan. Now pour in the prepared batter into the pans and bake in 180°C for 30-35 mins or until wooden pick inserted in center comes out clean. Note: If you want your cake plain without frosting, increase the sugar level by 1/2 cup or according to taste. Woooowwwww !!!! it looks so perfect !! I am just trying to have one bite from here only !!! I would eat the entire cake nithya ,it's so vibrant n pleasing to the eyes. Guests will surely get impressed no matter what.Got to try your version soon. 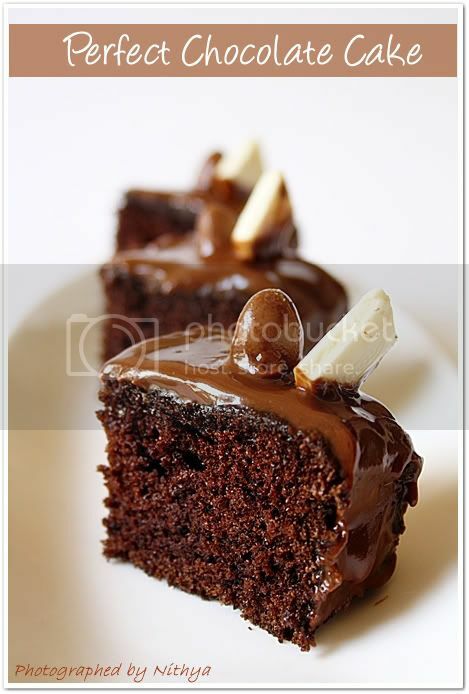 Me toooo I just love chocolates and this cake jus tlook so so drooley delicous. Wish i had a square or more. 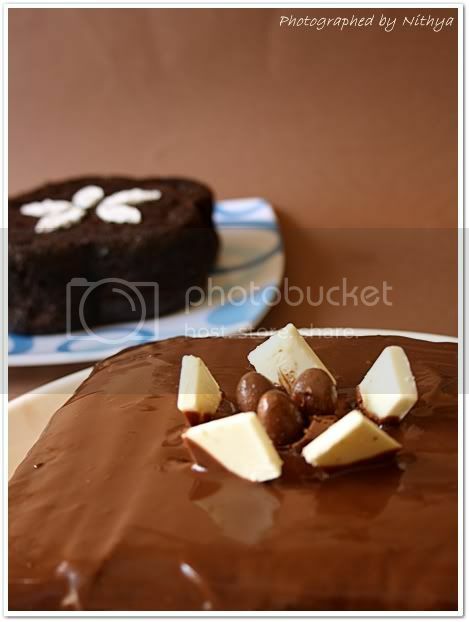 Looks so moist and yummy nithi.. wish I am there to have a slice(without making). I would be happy if someone makes for me. Sweet dreams are made of this! Yummy yum! very moist and decadent dessert. Love it. This exactly luks a perfect cake...very chocolatey. WooooooW !! the cake is soo moist and yummy.Perfect, Nithya. perfect choc cake nits...loved the presentation...great going da..
Wowww cant take my eyes from the click, looks prefect for chocoholic peoples like me...yummm!! woow!! !it looks perfect and moist..
Wow...... !! the cake is soooooo moist and yummy.Perfect..
looks very moist and delicious! I am a choc lover too!! Luved the last click very much! From one chocoholic to the other - keep it coming, and when its this good..it should never stop! certainly a perfect cake! Makes me so tempting. Great picture and drool worthy! OMG! Looks so mosit and rich cake.. I would finish this yummy cake in minutes! Wowwww Looks Heavenly. By Looking at them even the Gods would be tempted to come down to have a couple of bites. Love to indulge in them . Nice rich perfect chocolate cake. I like it. Cake looks yummy and moist. Is this from martha stewart? So moist and well baked dear, I am drooling over it. Looks simply perr...fect!!! Nothing like chocolate cake with vanilla ice cream.. Indeed! they are very perfect and moisty and tempting! Love the clicks Nithya. This looks just delicious !! This chocolate cake is superb . Looks temptiong and delicious. mm... feel like having it now. 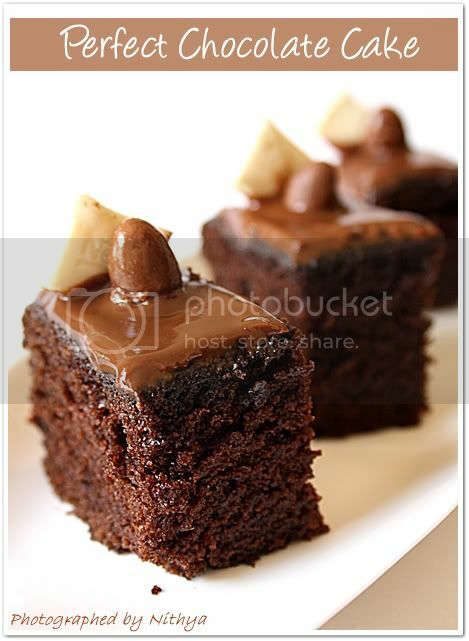 I am drooling at the awesome chocolate cake.Its chocolate lovers heaven.Beautiful clicks too. It looks so perfect!! Great presentation too.. wow! !really perfect chocolate cake...yummy and delicious! 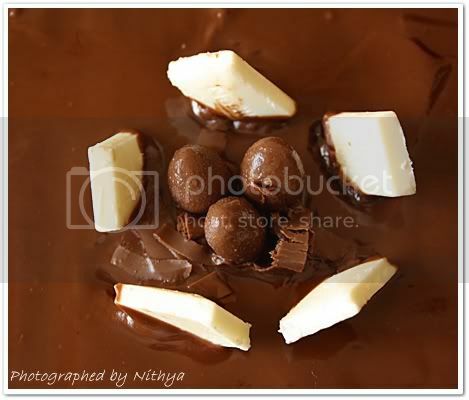 Wow..Awesome pics ,The chocolates are used to its best...Enjoy.. Am here after a v long time! hope all is well at ur end!! நித்யா உங்க கேக் பாக்கும் போதே எடுத்து சாப்டணும் போல இருக்கு..Looks lovely and very moist.YUM. Yum !! !One will never go wrong with chocolate!! This is my version !!!! 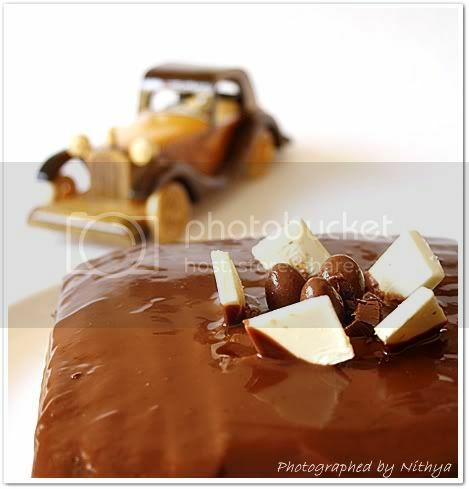 Superb pictures and the title is apt,its a perfect chocolate cake,so so delicious! Coming here for the first time. 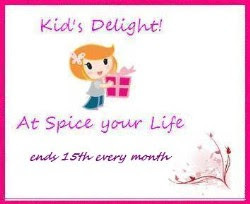 You have a neat blog with good recipes and amazing photographs. Awesome cake! It's tempting. That has to be one of the most exquisite chocolate cakes I have ever seen, looks so tempting ! perfect chocolate cake looks more than perfect! OMG!!! I am inspired to try this at home. Usually wary of baking, since the mix needs to be perfect and I am not the sort of cook who measures while cooking dishes and so on! But OMG, this looks like a must try!! Congratulations! 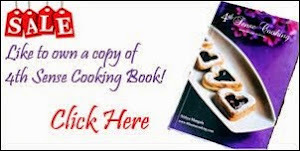 A well deserved winning recipe for the 30 best recipes of 2010. And you said it, the perfect chocolate cake. The stunning picture justifies it all! Yah..it is a perfect chocolate cake..love it. @Chaitrali - The recipe measurement is super fine. I have made this cake more than ten times now and have absolutely no complaints of dryness and not enough sweetness and infact a lot of friends have tried it too and have given me good reviews. I am just wondering what could have gone wrong for you!!!! I powdered normal sugar that we use and used it for the cake and it was really fine. Infact you could see that I baked this cake for my birthday too and it was really good. I believe you would have baked it for long time or in higher temperature that the cake lost its moistness. So relax and try it out again. You wouldnt fail getting this cake. I can assure you that and thats the only reason why I have called it perfect chocolate cake dear. 1) Is this cake supposed to be spongy or moist? Mine was spongy but it dint taste like chocolate. I used Weikfeild Coco powder. 2) The butter you used for frosting was regular butter or unsalted butter. 3) You have baked two cakes with the given measurements. Is it possible for you to give measurements for one cake only; meaning Of what quantity should the other ingredients be if I use only 1 cup Maida? 4) I would be glad to know what is the purpose of boiling water in this recipe. Hope I am not being a trouble to you. 1. This cake is suppose to be spongy and slightly moist. I used cadbury cocoa and it works fine for my always. But weikfield is also a good company, I really wonder why it dint taste like chocolate when it is cocoa!!! 2. I used unsalted butter. Its always best to use unsalted butter for all kinds of baking. Aavin cooking butter or Amul cooking butter are the best. 3. Its simple proportions buddy. Half the recipe if you want to make one cake only. And one cake is an unambiguous word, it all depends on the size of your mould isnt it!! 4. Water as such is to bring the batter to a lose consistency. And I believe that boiling water would help the soda and baking powder to react well and raise the cake according to my knowledge. Its not at all a trouble dear. Ping me anytime you need help :) Will be happy to clear your doubts. Thank u sooooooooooo much for this Perfect recipe .Baked cake for the first time and becoz of u it came out PERFECT . can we use half cup of melted butter instead of cooking oil. I never baked such a perfect moist, spongy chocolaty cake. Glad to follow you. Awesome posts. Your recipe looks delicious, waiting to try. Just wondering will not the boiling water cook the egg?